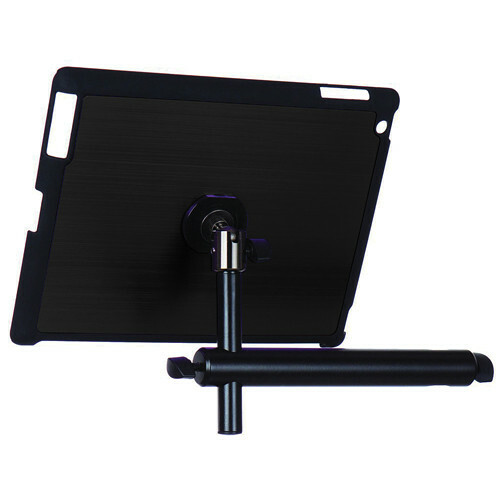 The gun metal On-Stage Tablet Mounting System with Snap-On Cover for iPad 3/4 is constructed from a combination of aluminum and soft velveteen plastic. There are precise cutouts for all of the tablet's controls, cameras, and ports. A 360° ball joint provides rotation and tilt adjustment, while the mounting post can be removed from the mounting bar for use as a comfortable handle during presentations, soundchecks, video chats and more. The mounting bar handles tubes and pipes from 11-19mm in diameter. The u-mount snap-on cover is compatible with popular magnetic front covers. Box Dimensions (LxWxH) 9.9 x 9.5 x 1.3"